AutoSpeed - Going Direct Injected Turbo Ethanol! Downsizing in combination with boosting and direct injection of a spark ignition engine has benefits, especially when that alternative fuel is ethanol. Technology company Ricardo has been investigating. There is a big push to use alternative fuels in the US, says product group director for gasoline, Rod Beazley, at Ricardo Inc. in Detroit. Beazley and his team are currently engaged in a project in this area known as Ethanol Boosted Direct Injection (EBDI), being carried out in collaboration with Behr, Bosch, Delphi, Federal Mogul, Grainger & Worrall Castings and Honeywell. In February, Ricardo announced the initial test bed results of the first prototype engine using this highly promising technology. With normally aspirated, flex fuel, spark ignition engines, there's a conflict of interest between burning gasoline with an octane rating of less than 100, and ethanol, whose octane rating is around 110. A compression ratio high enough to exploit ethanol properly would be unfeasibly high for pump gasoline. But with a boosted engine, cylinder pressures can be controlled using boost and valve control, while the mechanical compression ratio remains at conventional levels. “It's applicable to many different areas, including agriculture and medium-duty applications, that have traditionally used compression ignited [diesel] engines," says chief engineer Luke Cruff. "It really depends on how much downsizing you can get away with. In this case we are powering an 80001b [3.63 tonne] truck with a 3.2-litre engine which is a much higher level of downsizing than current convention." Downsizing means finding systems that deliver high-efficiency energy conversion. Because current systems are not fully optimised for ethanol and gasoline, not only is the full power and torque potential not realised when burning ethanol, but fuel economy is poor, too. However, EBDI solves many of the challenges faced by flex-fuel engines because it is optimised for both alternative fuels and gasoline. When operated on ethanol blends such as E85, current flex-fuel engines pay a fuel economy penalty of about 30 per cent compared to gasoline. The EBDI engine substantially improves ethanol's efficiency, and performs at a level comparable to a diesel engine. A combination of variable valve timing and lift, and clever manipulation of engine boost, can deliver an equivalent effect to variable compression ratio in a naturally aspirated engine. But the high pressures involved some physical engine modifications, says Cruff. The prototype EBDI engine is based on a standard direct injection, 3.2-litre V6 direct injection engine: the team modified it to withstand cylinder pressures of 180 bar rather than the usual 120 bar. “Although we made some substantial modifications," Cruff explains, "we didn't do anything to change the architecture such as increasing the number of cylinder head studs." Independent research conducted by Ricardo, outside the scope of the technical collaboration, indicated that hardware costs compare well with diesels. Ricardo estimates that the EBDI fuel system would cost in the region of $300 to $400: this compares with $2,000 to $2,500 for a typical diesel. The position with aftertreatment is similar. A diesel system costs in the region of $1,500 to $2,300, while EBDI runs using a standard three-way catalytic converter costing a fraction of the price of state-of-the-art diesel systems. 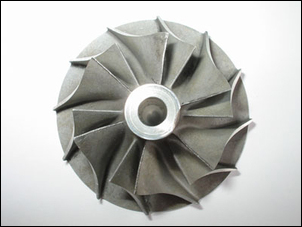 Turbocharging is achieved by parallel turbochargers of equal size and, at least for the purposes of the research programme, fixed geometry. Emissions targets are the current Federal Bin 5 or Californian ULEV 11 levels but EBDI promises huge benefits, not only in terms of sustainability but also cost. 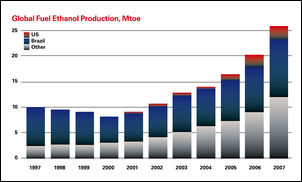 The future for ethanol fuel in North America and Europe is likely to be production from cellulosic feedstocks to avoid competition with foodstuffs and to increase the potential volume. In real-world terms, the efficiencies of this form of fuel production means that EBDI can potentially reduce the actual cost of transportation when compared to fossil fuels, and can do so based on a renewable fuel resource. Moreover, with estimates of the long-term cost of cellulosic ethanol production as low as $1.50 per US gallon and with the recent history of wide fluctuations in prices, a painful experience for many, EBDI's multiple fuel optimised capability could be a particularly attractive future powertrain technology. With initial testing now complete, the EBDI research team will focus both on test bed optimisation and on developing a vehicle based demonstrator. This will be based on a dual-wheel pick-up truck and is intended to be available for testing later in 2009. In summarising, Beazley emphasises the sheer scalability of EBDI and its potential reach far beyond the automotive and light-truck industry. "Imagine agricultural equipment that, in effect, burns what it harvests - corn, sugar cane or some other renewable substance. It could mean tremendous cost savings across many industries." With its inherent highly optimised fuel-flexibility, and its impressive fuel economy, EBDI technology could well provide a green future that could pay dividends too - in more than one sense.